Bhubaneswar:10/8/18: The Odisha government on Friday signed a memorandum of understanding (MoU) with National Bank for Agriculture and Rural Development (NABARD) for implementation of country’s first project Green Climate Fund, based in South Korea for massive groundwater recharge. 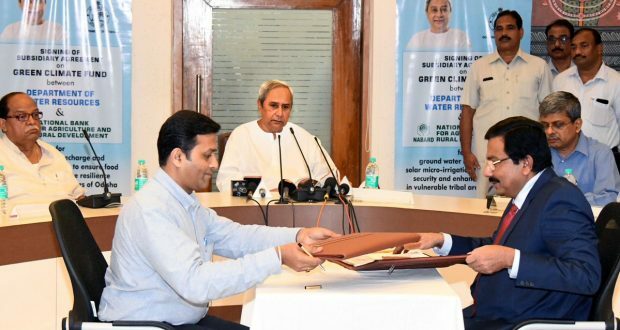 The agreement was signed between the Water Resources Department and NABARD at State Secretariat here today in presence of Chief Minister Naveen Patnaik. “The project envisages a massive groundwater recharge at a cost of about Rs 1,100 crore. The Green Climate Fund is giving an assistance of about Rs 240 crore while the state government will arrange the remaining fund through convergence funding,” Patnaik said.“I wish NABARD and departments of water resources, Panchayati Raj and drinking water and forest and environment to work together to create a model for adaptive action,” the CM added.